What do you relate when you read the title? The steamed Talapia fish 清蒸非洲鱼. I was introduced to this restaurant located in Kota Damansara long ago. Well, this wasn't the first time I visited Lan Je but I guess it was 10 years ago I had my first steamed Talapia by Lan Je at its HQ in Rawang. So how's the benchmark for the new branch? Honestly it wouldn't be fair to compare with the HQ in Rawang as it was so long ago, somehow I personally reckoned the dish wasn't as impressive as I experienced 10 years ago in Rawang. I think I could easily get comparable dish in Klang too. Could it be I lost the taste memory or my tongue has been spoiled throughout the years? Irregardless, don't get me wrong, this restaurant is still worth a visit if you have not tried before or if you happen to hangout nearby. Taste OK at affordable price. 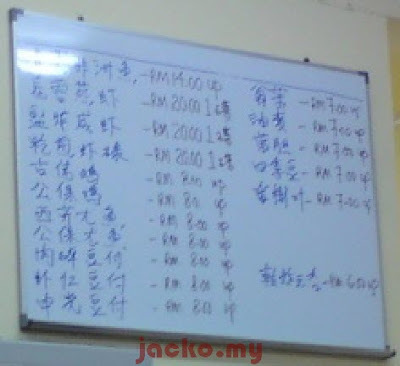 Look for Restoran Lan Je in MFM or N3 09.868 E101 34.459 or Jalan Teknologi 3/9. The feeder road has no name, so you have to go around to find it if you route there by road above.